Follow the flow of students — including 1,242 first-year students on Friday — moving in through video, photos, social media, student profiles and more. 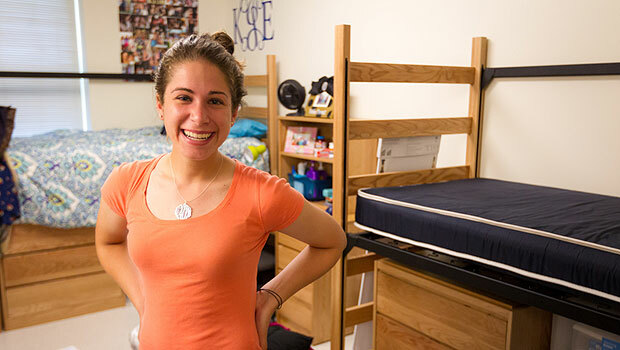 For new Wake Forest students, the first few days of college are hectic – moving into their residence halls, navigating the campus and preparing for classes. Part of this transition is learning the University’s traditions. It’s one of the reasons a weekend orientation session called The Making of a Demon Deacon is mandatory for all first-year students. But for 55 new students, a pre-orientation session sponsored by the Office of Campus Life & Leadership and the Wake Forest Traditions Council, started four days earlier and gave them a deep understanding about what makes a Demon Deacon. They participated in a campus scavenger hunt, visited the Old Campus in Wake Forest, N.C., dined in beloved eateries, and learned from living legends about the history and traditions of Mother, So Dear. This video follows their journey. This year, Wake Forest student athletes from football, basketball, volleyball, tennis and baseball teams pulled luggage, lugged boxes and carried cartons for incoming students on move-in day. We caught up with some first-year students and their parents as they moved into their residence halls, met their roommates and began to feel at home. One of the members of the Class of 2016 has developed a sleeper pod for NASA. Another speaks Haitian Creole. Many are already attacking real-world problems head-on. Learn more about some accomplished WFU newcomers by reading our first-year student profiles.